Share the post "How to Shop More Mindfully for Healthier Food in the Store Cupboard"
Do you hate the way your store cupboard seems to be full of the wrong sort of food? Are your shelves brimming with high-sugar, processed foods you don’t even remember buying? Maybe you need to follow a few simple rules, so you can shop more mindfully, and bring home the foods that will help you and your family eat a more wholesome, healthy diet. Mindful living is about living fully in each moment, free from distractions. Too often, we drift through the grocery store on auto-pilot, filling our baskets with whatever impulse purchase the shop is promoting that day. Make a shopping list and do your best to stick to it. Your list should be linked to planned menus, with healthy fruits, raw vegetables and unsalted nuts for snacks. No food should be completely forbidden, but think about what you are doing whenever you put something unhealthy into your basket. Before you enter the grocery store, take a few seconds sitting in your car in the parking lot. Close your eyes for a moment and take some deep breaths. Remind yourself that you and your family deserve wholesome, healthy food. You might decide to avoid aisles containing foods which are not on your shopping list. Whenever you are about to put food which is high in sugar, salt or highly processed into your basket, ask yourself whether your health-conscious mother/ sister/friend would buy this type of food. Try never to go shopping for food when hungry. If you cannot avoid this, eat an apple or similar healthy snack just before you enter the store. A recent study by scientists at Cornell University, found that shoppers who were offered healthy snacks at the start of their shopping trip were more likely to buy healthy foods than those who were given unhealthy snacks. 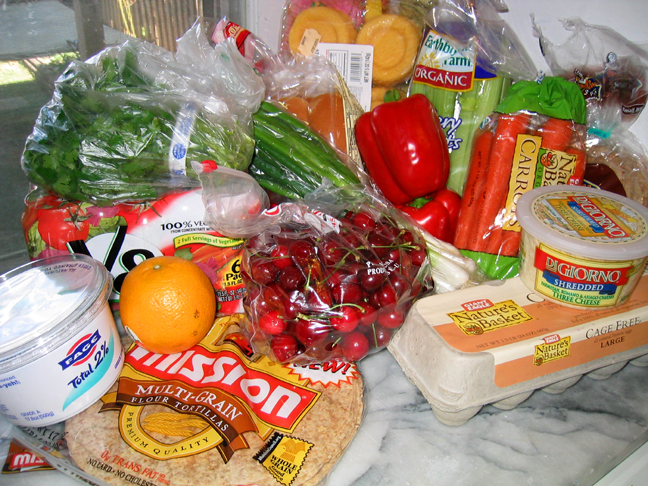 Try to avoid shopping for food when stressed or angry. Your mood can significantly affect your ability to resist impulse-buys. It helps to have an awareness of some of the psychological tricks shops use to tempt you, the unwary shopper to leave with all kinds of items which were not on your shopping list. Is the store layout one that encourages customers to pass through areas selling less essential, more expensive produce first? Beware of special promotions and buy-one-get-one-free offers. Will your family really benefit from that second pack of cookies or larger pack of potato chips? Be aware that items on which the store has the highest profit-margin are more likely to be displayed attractively at eye-level. Now there’s no excuse for having the wrong sort of food in your grocery cupboard ever again. Happy shopping!